Arguably, nostalgia is a double-edged sword. On the one hand, you can take inspiration from some really great sources and mold them into your own image; on the other side of that coin, it’s easy to fall into the trappings of becoming a rip-off. There’s a stark difference between Warhol’s Campbell Soup Cans and Owl City’s Fireflies: one altered the public’s view of contemporary art, and the other one is a forgettable single that will be replaced in a year. 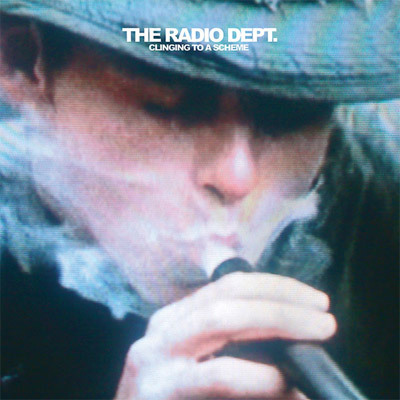 Sweden’s The Radio Dept. teeters to become the former. Taking cues from My Bloody Valentine, The Cure, and Grandaddy, The Radio Dept. are able to coalesce elements of shoegaze and pop all over their album, Clinging To A Scheme. The beginning of the album’s second track, “Heaven’s On Fire,” is punctuated with a sample that questions the value of youth culture before launching into a jangly guitar riff. Without that sample, the song would’ve stood on its own merit, but the inclusion adds more to the idea that The Radio Dept. have calculated and combed over every bit of this record. It’s such a small, but integral, piece to a bigger puzzle. There’s a similar bit in the centerpiece, “Never Follow Suit,” that borrows a monologue from Style Wars, in which graffiti writer Skeme says, “All these other people who don’t write, they’re excluded. It’s not for them.” It’s such an obscure sample, but it works perfectly in the song’s (and album’s) overall theme of non-conformity. As people and pop culture get older, it’s easy to make music disposable, which is why bands like The Radio Dept. are crucial. They’re a reminder that there’s room and a place for music to mean something and have emotional resonance, and that not all inspired art will be hated.